Tear gas and pepper spray were so last week. On Friday, Day 6 of the Umbrella Movement, masked thugs fanned out at all three protest sites across the city, starting with Mongkok and quickly spreading to Causeway Bay. 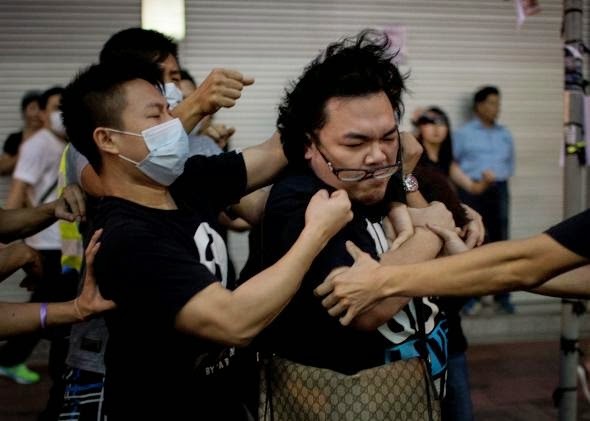 By nightfall, angry mobs had moved into the movement's nerve center in Admiralty. 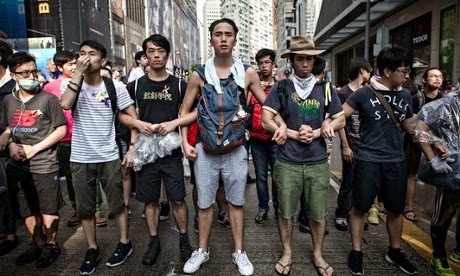 They called themselves “pro-Hong Kong citizens” — vigilantes who had self-organized to clear the streets and restore public order. They had taken matters into their own hands because they believed the cops had been too lenient toward the students. I had arrived in Admiralty earlier the evening to offer protesters free help with homework. I was telling the stories of Rosa Parks and Martin Luther King, Jr. to two university freshmen, when my phone started to buzz with ominous text messages. “The Triads are heading your way. Stay Safe!” a reporter friend warned. “Leave Admiralty NOW, and remove any yellow ribbons on you,” said another. 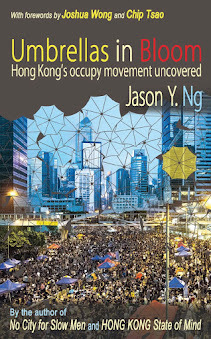 The yellow ribbon was a symbol of the occupy movement, as was the yellow umbrella that gave the movement its name. Pro-Beijing groups had taken notice and come up with a symbol of their own: a blue ribbon in support of police officers. Many of the thugs in Mongkok were seen wearing the blue ribbon. I didn’t pay much attention to my friends’ warnings. They weren’t anything new — rumors about Beijing mobilizing Triad members to harass protesters had been circulating on social media for days. With so many false alarms going off this week, we had learned to take things with a heap of salt. That said, fighting crowds with crowds is nothing new. Rent-a-mobs are routinely deployed during political unrest in Thailand and the Philippines. They are a weapon of choice not only because links to a mastermind are hard to prove, but also because they give authorities a convenient excuse to use force. 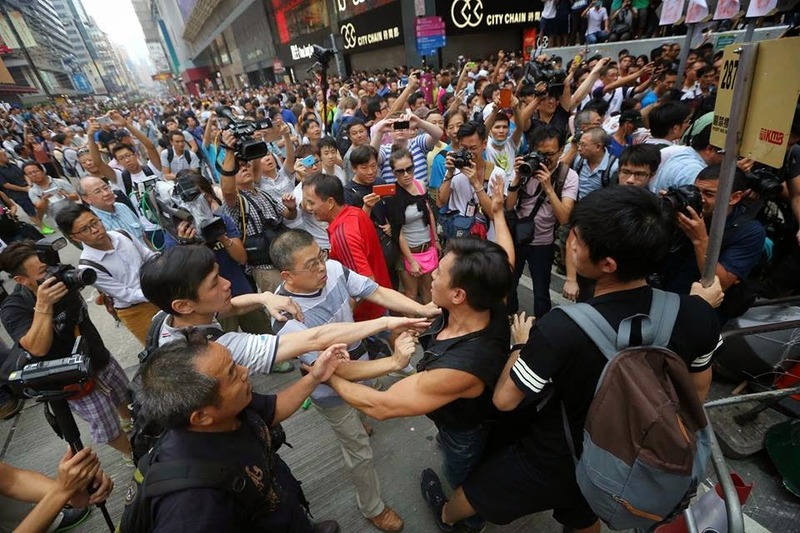 A scuffle between yellow and blue ribbons in Mongkok, for instance, would give police the legal and moral authority to clear the area. I told my “students” to go home and continued scrolling through the news feed on my phone. The situation had deteriorated rapidly in the last several hours. Amateur videos of physical and sexual assault abounded, many of them were too gruesome to watch. The assailants — who should be called domestic terrorists — were systematic in targeting protesters and journalists. Much of the public outrage was also directed at the police’s flagrant inaction. Some uniformed officers were seen standing idly by with their arms folded, while others took advantage of the mayhem to remove barricades commandeered by students. There were also video clips showing police officers guiding Triad members into the occupied areas, or faking an arrest only to release the suspect on a quiet street corer. I continued to sit on the sidewalk, overcome with disgust, frozen in disbelief. I had many unanswered questions. Were the blue ribbons gang members or disgruntled citizens? Were they hired by Beijing? Were they working in cahoots with police? The only thing I knew was that whoever was behind the coordinated attacks had run out of options and was desperate enough to make a deal with the devil. 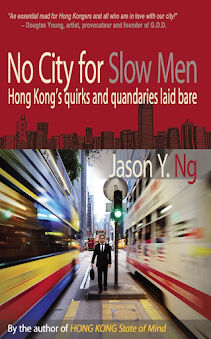 In Hong Kong, resorting to the underworld to handle tricky situations is an open secret and a time-honored tradition. Local mafias such as Wo Sing Wo and 14K are typically hired by moneylenders to collect unpaid debts or by property brokers to intimidate stubborn residents who hold up lucrative real estate projects. I decided to heed my friends’ advice to leave the protest site before the mobs arrived. I spent the rest of the night at home watching the clashes in Admiralty play out on live television. Images of peaceful protesters being beaten and not fighting back broke my heart and sickened my stomach. The next morning, I woke up to more news reports of fracas happening all over the city, as some of the protesters attempted to reclaim Mongkok and Causeway Bay. At a news conference, Security Secretary Lai Tung-kwok (黎棟國) vehemently denied claims of collaboration between police and the Triads. On a radio show, cabinet member Lam Woon-kwong (林焕光) dismissed the allegations as a “fairy tale.” I drifted in and out of sleep while footage of street violence interweaved with public statements by government officials. By 1:30 pm, I was still in bed, staring unseeing at the television set. I was disgusted by the ochlocracy in our streets and the little that had been done to stop it. I was angry with some of my Facebook friends who applauded the blue ribbons for teaching student protesters a lesson. Above all, I was depressed by the hopelessness of the situation, for the mob attacks would only get worse in the days to come. I found myself right where our enemies wanted us to be: a state of dejection and defeat. “You are smarter than that,” I told myself. I then willed my body out of bed, took a cold shower and ate a hearty lunch, the first proper meal in the last 48 hours. 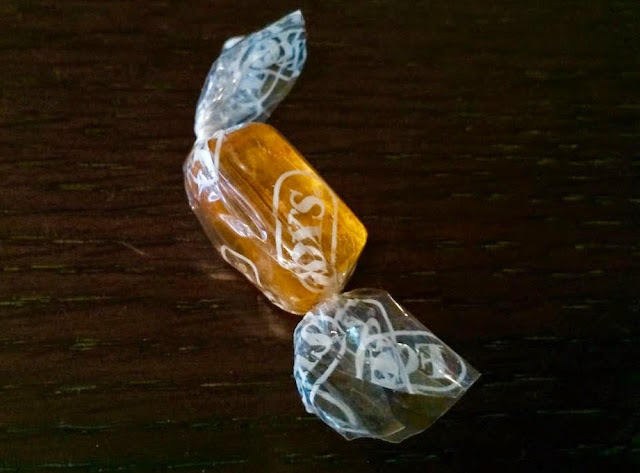 As I emptied my bag, I found a piece of hard candy given to me by a student volunteer the night before. My eyes started to well up, for the gift reminded me of how much they had done for the city and the long way they had yet to go. It also gave me a much needed boost of energy. I started to focus on what lay ahead. At this critical juncture, we must regroup, reassess and re-strategize. If it meant retreating from other protest sites to fortify the stronghold in Admiralty, then that’s what we would do. Whatever our next move might be, we must stay a few steps ahead of our opponents. We must not lose faith in our cause and play into the hands of the mobs. We must remember, no matter how grim things may look at the moment, that the night is always darkest before dawn. 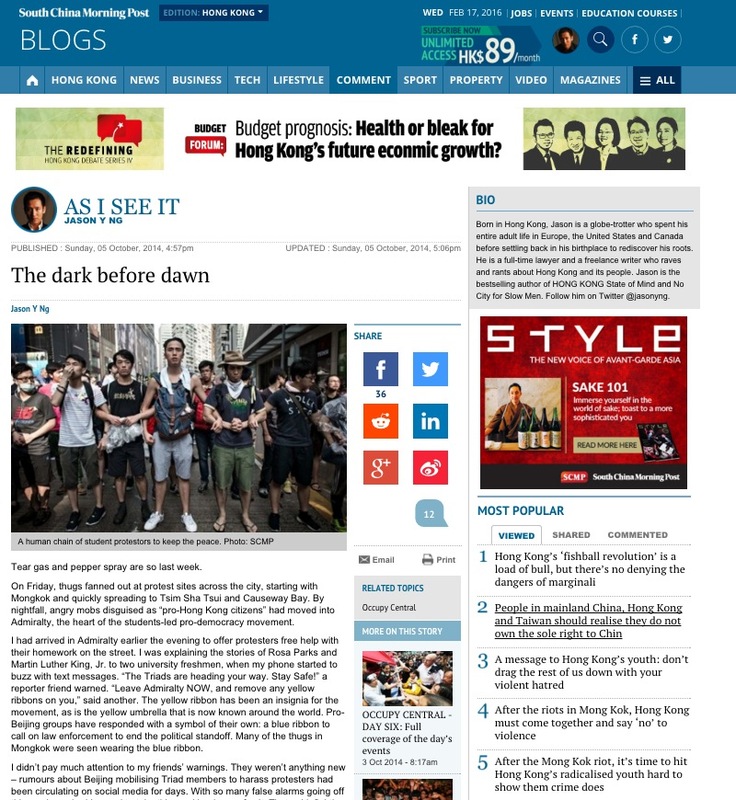 This article was published on SCMP.com.